Stepping into the Mary Immaculate of Lourdes Parish church in Newton at Sunday noontime feels like stepping backward in time. Hundreds pray solemnly in Latin, rising and kneeling frequently, as reverent Gregorian chants echo off the sanctuary's soaring stained-glass windows. The air is thick with incense, women wear chapel veils, and everyone - parishioners, altar servers, and the Rev. Charles J. Higgins - prays facing the church altar and the large crucifix hanging above. This is the Tridentine Mass - known more familiarly as the Latin Mass - that for 40 years was an endangered species of worship in the Roman Catholic Church. After the Vatican decreed in the mid-1960s that local parishes could conduct Mass in their native languages, the old rites fell out of favor among mainstream and progressive Catholics. But a small, loyal following among the faithful clung to the old rites, some even worshiping covertly with a sympathetic priest rather than attending English-language Sunday Mass. But the traditionalists are back, buoyed by new support from the Archdiocese of Boston and a controversial decree last April from Pope Benedict XVI that parishes could, with a willing priest and con gregation, hold the Latin Mass without seeking approval from their regional bishop. The old rite's arrival in Newton has brought a sea change for the small Upper Falls parish church known for its European-style liturgical art and architecture. Mary Immaculate had been on the Archdiocese of Boston's parish closure list for three years, and its days appeared numbered. 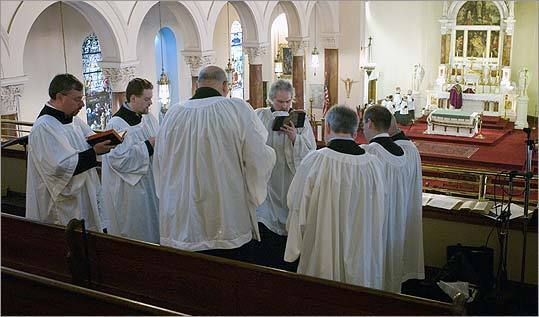 Then, a few months before Benedict's decree, archdiocese officials announced that they would permanently transfer its primary Latin Mass from another endangered church, Holy Trinity in Boston's South End, to Newton. Overnight, the move added more than 200 congregants to Mary Immaculate, including Dottie Fresolo, 70-year-old Cambridge native and a lifelong enthusiast of the Tridentine rites. "God deserves the very best we have to offer," she said. "The sanctity, the silence, the respect, and the dignity of the service is the best we have to give." Christine Higgins is another Holy Trinity member who has become active at Mary Immaculate. Like nearly all Latin Mass advocates, she describes a feeling of spiritual peak during the service that cannot be replicated by a more conventional, Novo Ordo Mass. "I think the appeal is that we are all looking for something reverent and holy to take our minds off ourselves," she said. "There is a sense of worshiping together, and that something big is happening." Many traditionalists travel hours - some from New Hampshire or Maine - in search of Tridentine rites. They share facilities with the Mary Immaculate congregation of more than 300, who worship in English with Higgins in the parish's other services. Right now, it is two very different Catholic churches under one roof, the priest acknowledged. "I think it is working out and the church is full, and we thank God for that. But I would like to see the neighborhood parish feel more ownership and feel that the Latin Mass is part of their parish life, and feel at ease visiting one once in a while," said Higgins. Higgins admired the Latin rites so much as a young man that he taught himself how to perform them. "People who attend a high Latin Mass get a very strong sense of being part of an ancient religious tradition, and that can be a very soothing and uplifting experience," he said. Ancient religious tradition was what some Catholics hoped would be left behind when the Tridentine Mass was widely discarded after the 1965 modernist Catholic movement known as Vatican II. Many considered the rites archaic, inaccessible to all but a few, and even anti-Semitic, citing references in some ancient Latin texts that said Jews live in "darkness" and "blindness." But since Pope Benedict's decree, more Boston-area Catholics have been attending old Mass at Mary Immaculate, as well as less-formal Latin rites at St. Columbkille parish in Brighton and Sacred Heart in East Boston. Many have young children, born decades after the old rites fell out of fashion, who are embracing the rituals. Last year, Mary Immaculate confirmed 55 children and adults in a Tridentine ceremony - including eight from the Mary Immaculate parish. Two others decided they would prefer Novo Ordo rites and were confirmed at St. Joseph's in Needham, Higgins said. Religious education classes for children are held separately for the Tridentine families - their First Communion pupils learn some Mass customs differently, such as accepting the wafer directly onto their tongues, never in outstretched hands. Colbe Mazzarella of East Boston, a former Holy Trinity parishioner, brings five of her children to weekly Latin Mass in Newton. "It's more reverent and holier. I like it better," said her daughter Catherine, 16, during a crowded coffee hour after last week's service. Allen Maynard, a director of Una Voce America, an international group formed after Vatican II to advocate for the Latin Mass, said one of its challenges was to reintegrate with mainstream Catholic life. "We may be traditionalists, but we don't seek to be separate," said Maynard. "But after 40 years in the wilderness, there is a divide, but we try to fit into parish life as best we can." Latin Mass advocates do not want to impose their form of worship on Catholics who prefer modern services, he said. "Contrary to popular belief, we don't want to take over the world," Maynard said with a smile. It's hard to determine how many people attend Latin Mass, but Una Voce said it has seen an renaissance, at least anecdotally, and that about 120,000 copies of the Latin-English missal translation used by most churches had been sold over the past year. Una Voce has so far trained about 100 American priests in the rites and hopes to teach more, said a spokesman, Jason King. "This is the Mass that has bought us so much solace since the time of Christ," he said. "It is a unique and critically important part of our Roman Catholic faith." Matters of Faith is a series of occasional articles examining religious life in area communities.